Birth Options Alliance (BOA) provides information and mutual support to expectant parents about their choices regarding childbirth in the Washington, DC area, as well as advocates for the expansion of birth options. Our group consists of current and expectant parents, as well as midwives, doulas, childbirth educators and other birth professionals . The group was originally formed as the Takoma Park Birthing Circle in 2003 by playwright and activist Karen Brody, who since went on to write the internationally renowned play Birth. The group met monthly to discuss current birth-related topics. 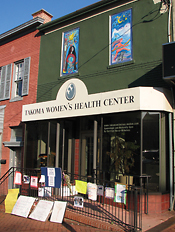 In spring 2007, two midwifery options in the Washington, DC area closed within a month of each other: Takoma Women’s Health Center in Takoma Park, MD, a hospital-based midwifery practice with a devoted following, and the Maternity Center in Bethesda, MD, a freestanding birth center with a 30-year history. These closings followed the loss of several other Washington, DC area midwifery practices, and were a wake-up call to people concerned about birth all over the DC area. The group changed its name to Birth Options Alliance, expanded its mission to include advocating for expanded birth options, and experienced a surge in membership. Today, Birth Options Alliance continues its efforts to share information with expectant parents about their choices, and support them when they have made their decision. The group accomplishes these goals through compiling and distributing directories of care providers in the DC area, and by hosting an online discussion group and Facebook page, where just about any question about birth options is asked and answered by BOA’s more than 1000 listserv members.